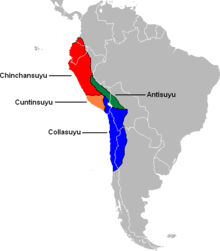 Antisuyu (Quechua anti east, suyu region, part of a territory, each of the four regions which formed the Inca Empire, "eastern region") was the eastern part of the Inca Empire which bordered with modern-day Upper Amazon region where the Anti inhabited. Antis is a collective term for the many varied ethnic groups living in the Antisuyu such as, for example, the Asháninka or the Tsimané. The second smallest of the suyu, Antisuyu, was located northwest of Cusco in the high Andes. Indeed, it is the root of the word “Andes.” Along with Chinchaysuyu, it was part of the Hanan Suyukuna or "upper quarters" of the empire. Most of the lowland jungle wasn't part of Tawantinsuyo. Only the jungle region could not be dominated by the Incas, given that they couldn't colonize the jungle region. Arguably, the first organized and planned naval action of Peru, was in time of the Sapa Inca Tupac Inca Yupanqui, as it mobilized 10,000 men and their supplies on large rafts navigating the rivers, a task that took two years, After that campaign, he went to the rupa rupa of the Chunchus, was a catastrophe for the Incas, since according some authors returned only 1,000 soldiers alive. After subjecting the Chunchus, very few arrived at Musu. ↑ Vega, Garcilaso de la (2014-05-12). Royal Commentaries of the Incas and General History of Peru, Volume 1 and. University of Texas Press. ISBN 9780292767027.